All routes start at Mission San Jose High School in Fremont. Note: We reserve the right to change the routes, if external events prevent us from using the original route. Complete Century (100 miles, 5800 ft climbing): Start at Mission San Jose High School in Fremont and ride south toward Calaveras Road. Go up Calaveras Road, over “The Wall” and then a beautiful cruise alongside Calaveras Reservoir. On to Sunol, Pleasanton, and Livermore, past vineyards to the top of Altamont Pass, past wind turbines to lunch at a winery. Up the Dublin Grade and along quiet Palomares Road to Niles Canyon, and back to Fremont for a hearty meal. 85 Mile (85 miles, 4550 ft climbing): Same as Complete Century, but skip Altamont Pass. 100K (63 miles, 3950 ft climbing): Same as Complete Century, but skip the loop through Livermore and Altamont Pass. Fun Ride (25 miles, mostly flat, 464 ft): Pedal to Coyote Hills Regional Park, using parts of the Alameda Creek Trail on this mostly flat, fun, and educational ride. Experience the FUN of an organized ride! Suitable for newer riders, or those riders just returning to bicycling. 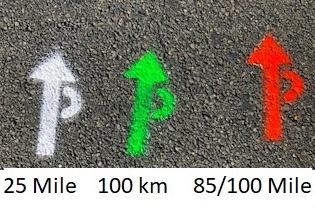 NOTE: There may be other markings on the road that look similar. Look for the “P” as part of our marking. 100 milers need to be at the turn from Sunol Blvd by 11 AM and out of the first winery stop by 12:30 PM. Sunol Glen School stop closes at 1:00PM. Rios Lovell Winery stop closes at 2:00 PM. 25 milers Staging Area Rest Stop closes at 1PM, Beard Staging Area closes at 2:00PM, Water Stop at end of trail closes at 2:30PM. Entire route closes at 5:30 PM. Read the Travelogue for full route description and highlights!